If my kitties could do this, they definitely would. 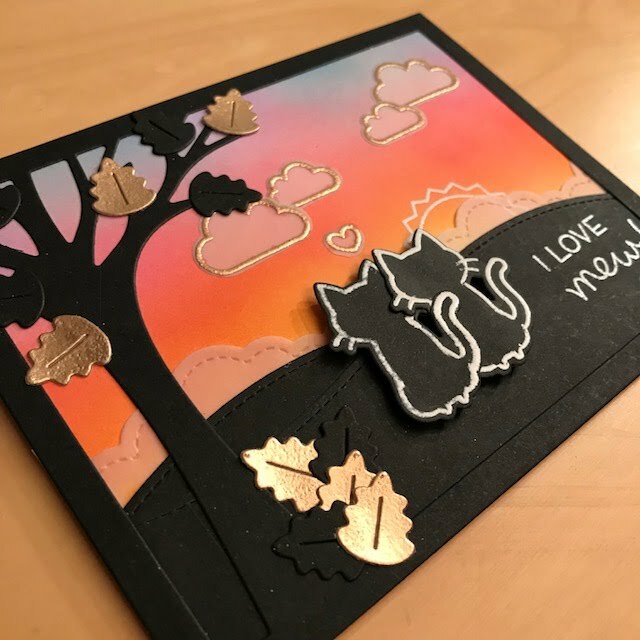 Just love this cute set "Ornamental Newton" from Newton's Nook and created this little card for it. The branches are from the Lawn Fawn set Frosty Fairy friends. 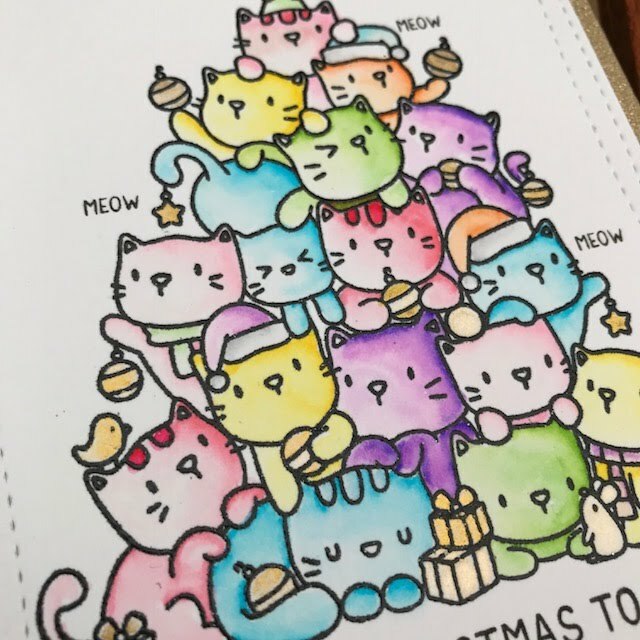 I made two cards with this cute image (I need all the Copic practice I can get). I only changed up the patterned paper and the color of the sequins, otherwise they are the same. 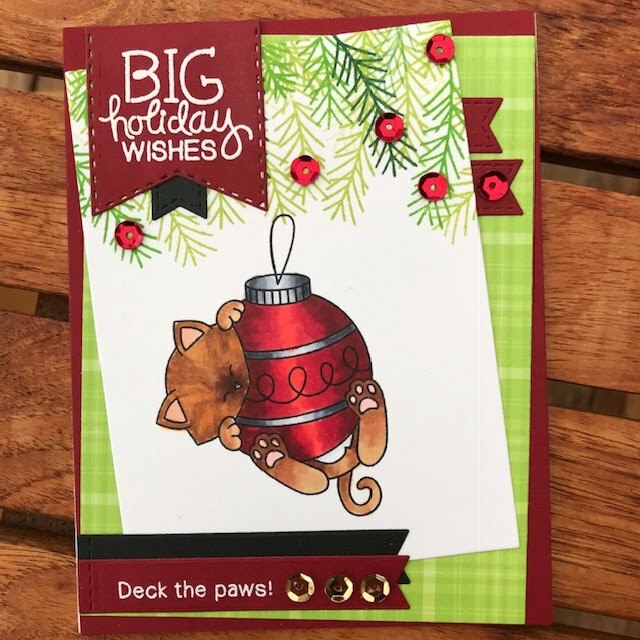 I entered this card in the Inkypaws Challenge #85 which was a color challenge and I got picked as a favorite. Yay. 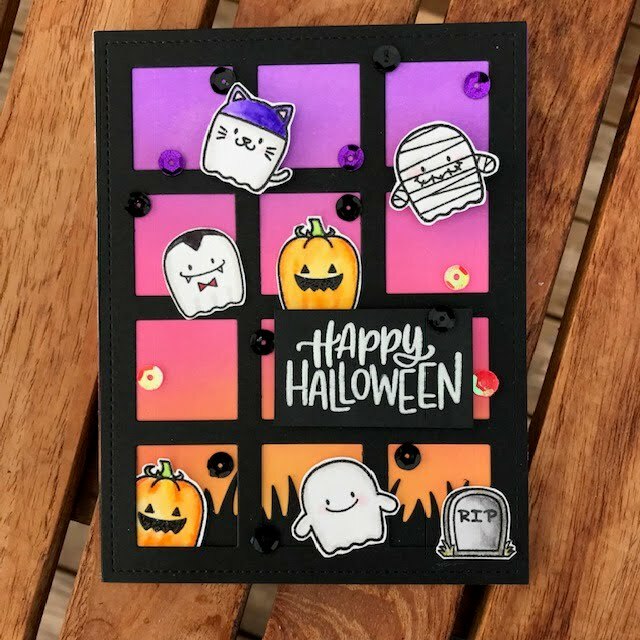 Love these cute little ghosts from My Favorite Things. 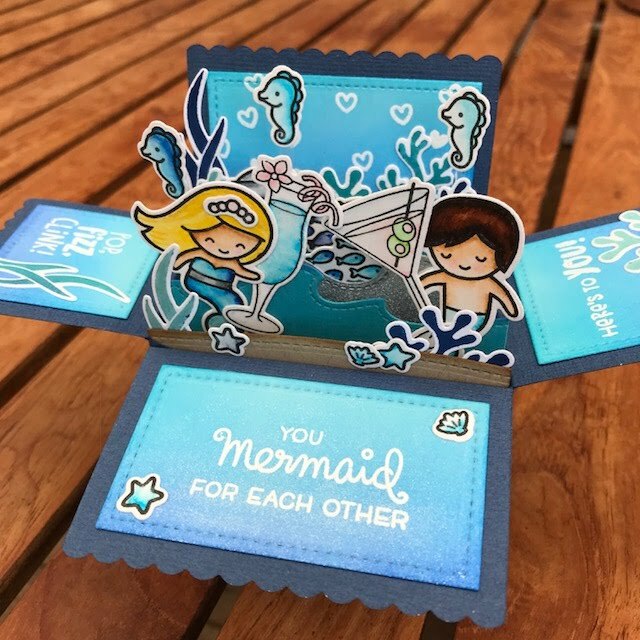 The sentiment is from Simon Says Stamp and embossed with glow-in-the-dark embossing powder from WOW! It works great. Frame is from Mama Elephant, Grid Window, grassy border from Lawn Fawn and the background is done with Distress Oxides. The latest release from Mama Elephant was so cute. 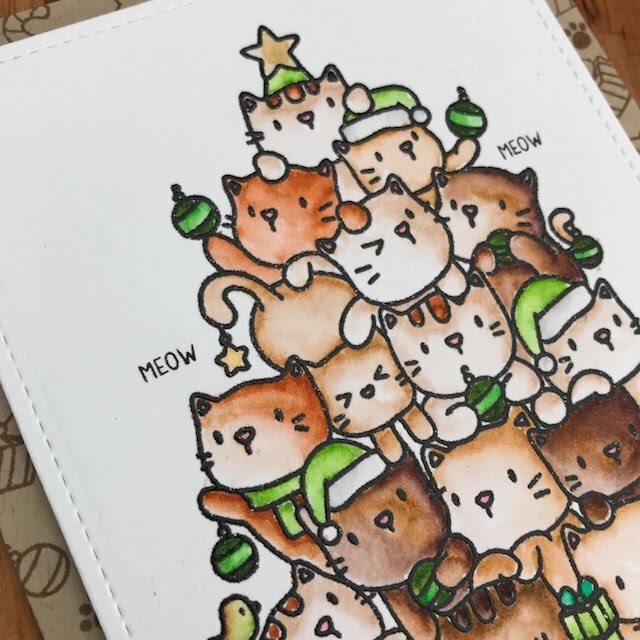 My favorite however had, hands down, to be Oh Kitty Tree. Here I have colored it again with Zig Clean Color Real Brush markers in pastel colors. I first heat embossed with Versafine Onyx black ink and clear embossing powder. For the gold details I've used Kuretake Gansai Tambi Starry colors. 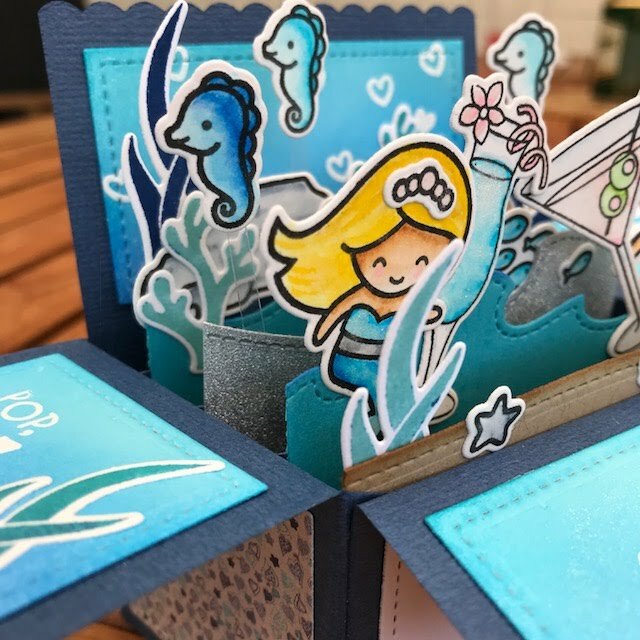 The panel is die cut with the Wonky stitched frame from My Favorite Things. 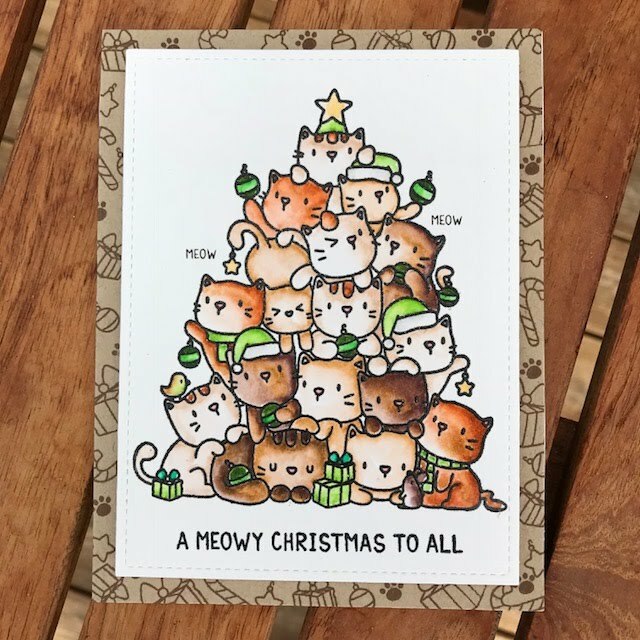 A meowy christmas to all! Last weekend I got the new Oh Kitty Tree from Mama Elephant and immediately wanted to take it out for a test drive. There is a challenge going on at Cupcake inspirations right now, color challenge, and the colors are brown and green. 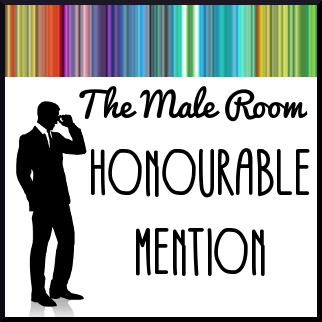 So, this is my take on it. 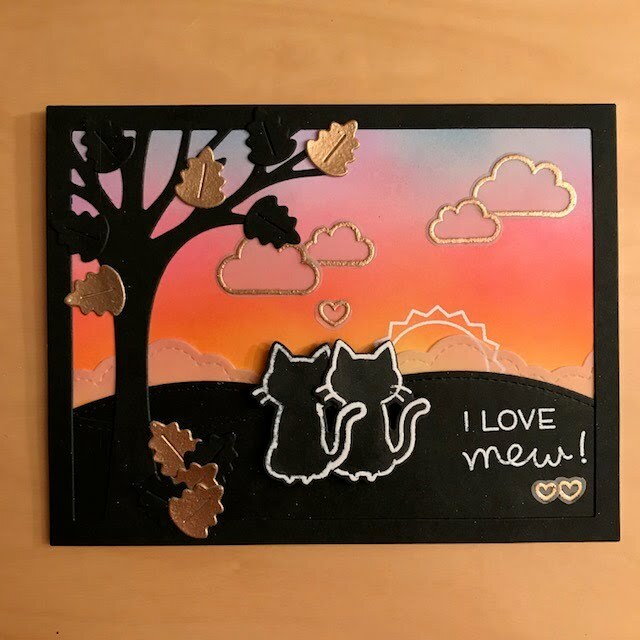 The kitties and sentiment are heat embossed in black (Versafine Onyx black + clear embossing powder) and then I colored with Zig Clean Color Real Brush markers. Some of the details are done with the Starry gold colors from Kuretake. 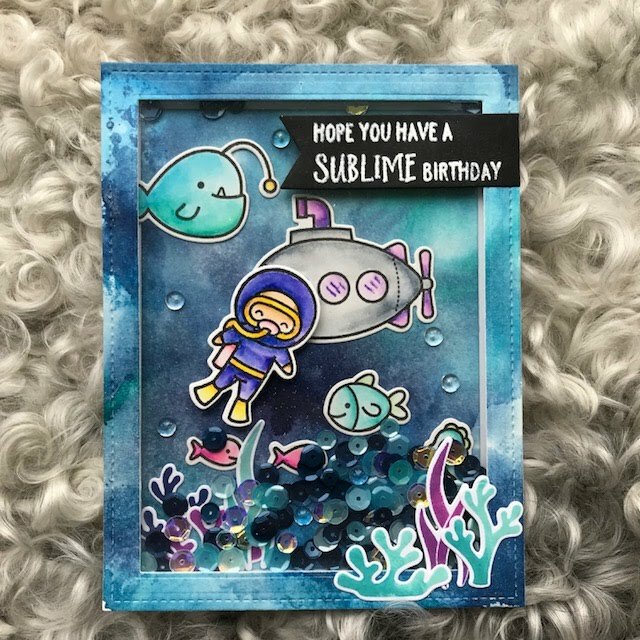 The background I stamped with some of the small stamps in the set. 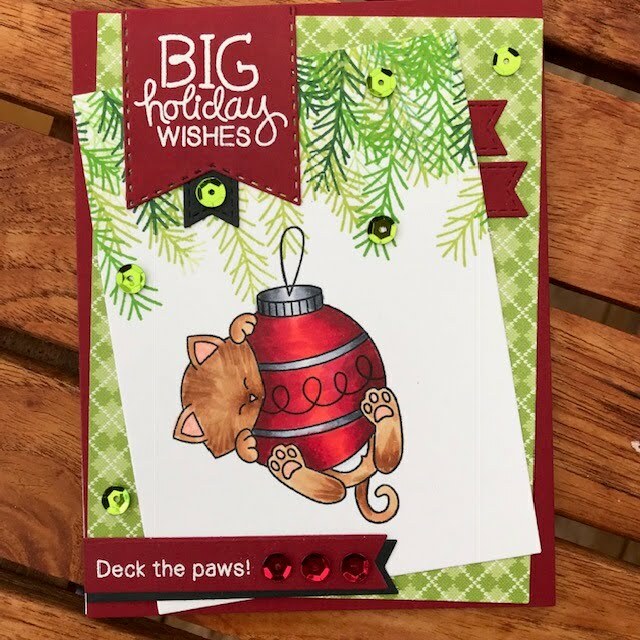 I used Lawn Fawn ink on craft card stock. The panel is popped up with fun foam to add a little extra. I can't get over how cute this stamp is. 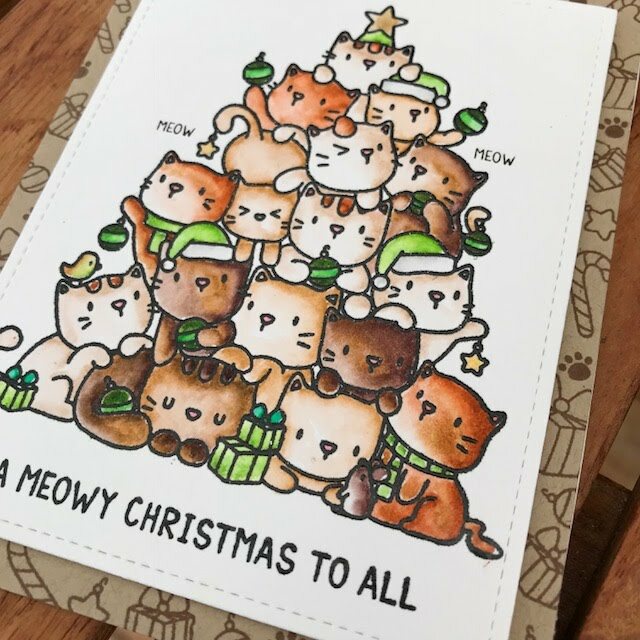 I'll be sending lots of kitty cards this Christmas. 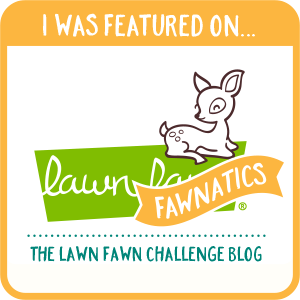 This is my entry for this round of the Lawn Fawnatics challenge 34 which is all about "My favorite place". I love sunsets. Really. I have a very hard time tearing my eyes away from one. 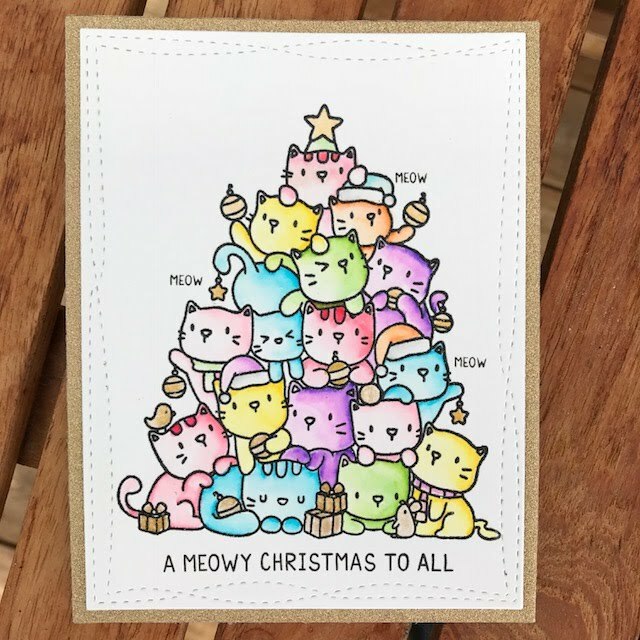 I also love kitty cats so that kind of decided the theme for this card. 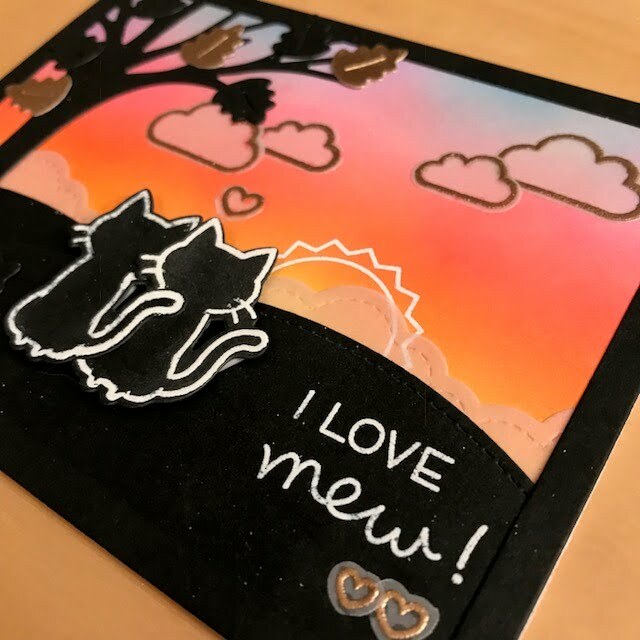 I used the Lawn Fawn stamp set "Meow you doin'" for the cats and the sentiment. 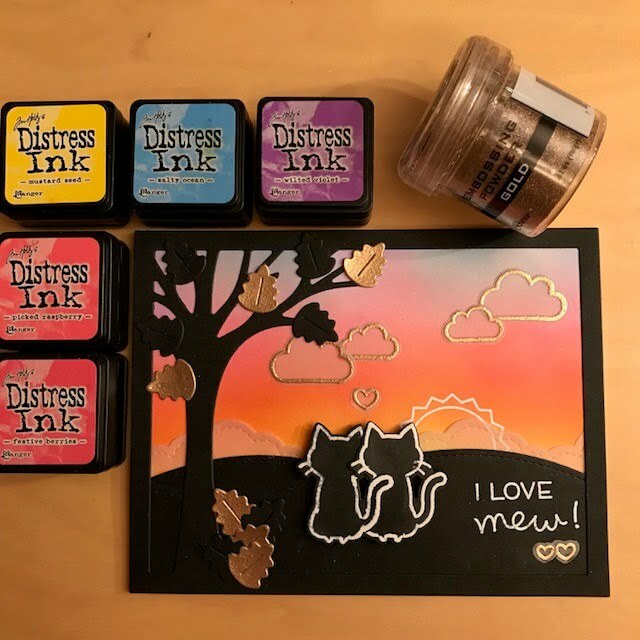 I used a Versamark pen to only get ink on the outside lines of the kitty so that it could look like they were staring away in the sunset. The hearts and clouds are from "Plane and simple" and are heat embossed on vellum. 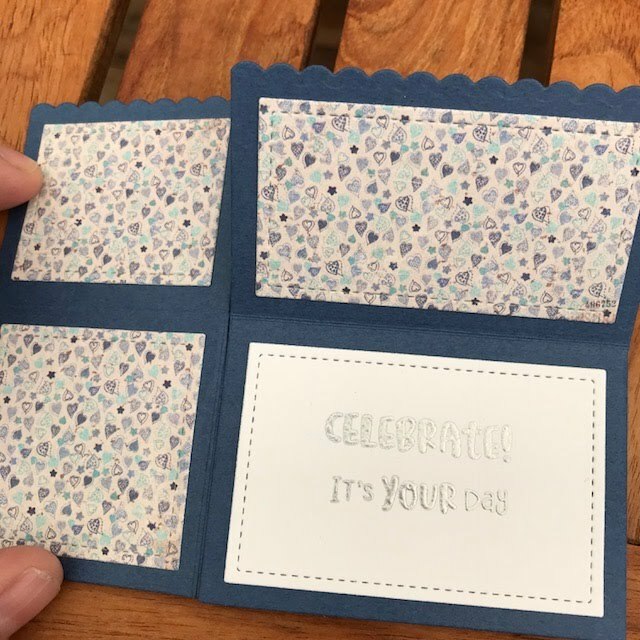 The sun is from "Out of this world", heat embossed in white on the background. I tried to hide the adhesive behind the heat embossed lines on the vellum but that's easier said then done...! Half the leaves are embossed in gold and the other half are cut from black cardstock. 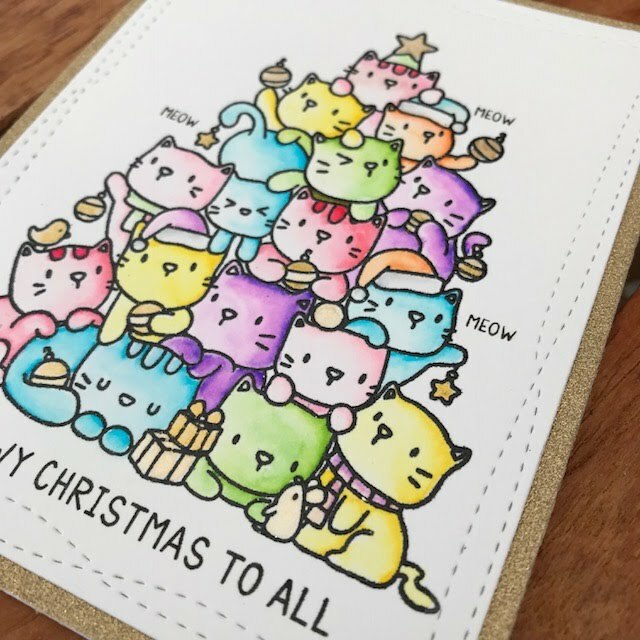 Used one of my ink smooshed backgrounds to create this shaker card. I used a Lawn Fawn Large Stitched Rectangle and also a rectangle to create the frame. The frame is popped up with foam tape and the panel is inset. 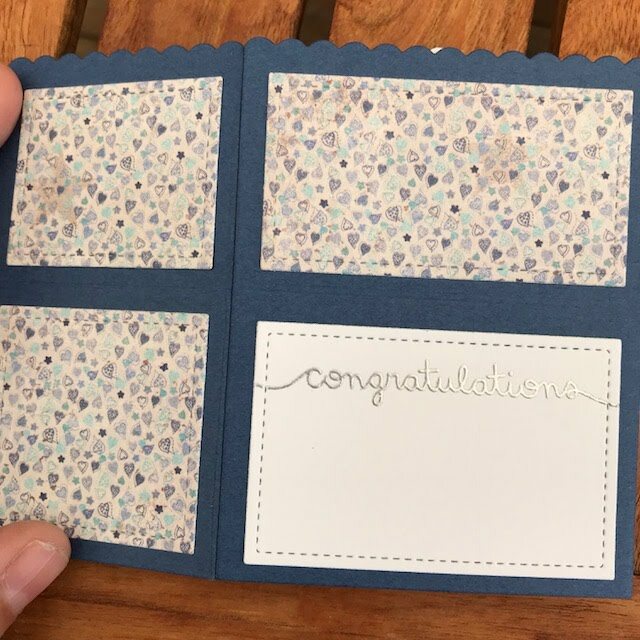 A friend asked me to make a wedding card for a couple that likes partying and sun and swimming. 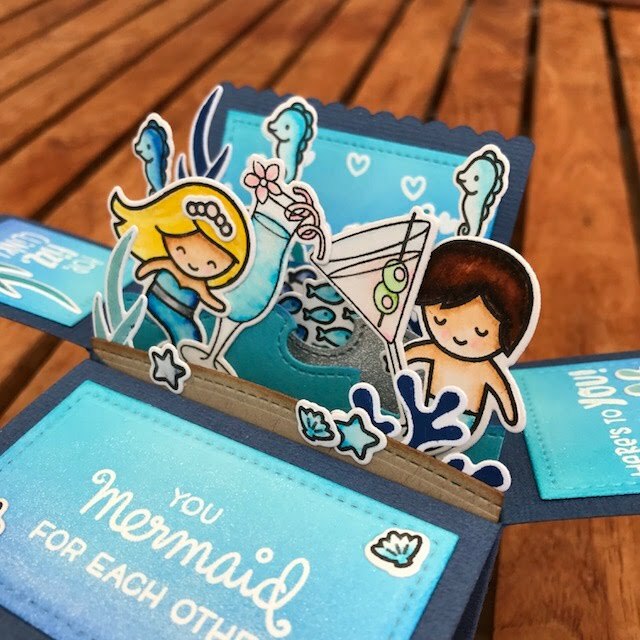 She really liked the scalloped box popup card so I decided to go with the Lawn Fawn set "Mermaid for you" with a couple of drinks and sentiments from Newton's Nook Cocktail mixer stamp set. Undersöker vardagen med en lagom portion nyfikenhet!